Gross Weight Rating 9,990 lbs. This is a Big Tex 10,000 lb. 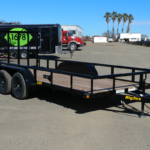 rail style equipment trailer. It has a heavy duty 2-7/8″ round tube rail on the front and down both sides. The side rails are 16″ tall. 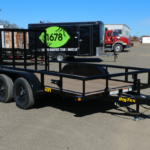 The 10PI-18 has a payload capacity of 7,700 lbs. and is most often used to haul tractors, trucks, heavy cars or other off-road vehicles. It comes standard with heavy duty ramps that store under the deck. The deck height is only 20″ so it’s very easy to load most vehicles.